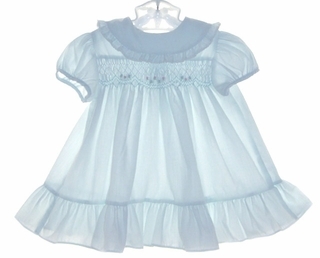 This lovely little pastel blue cotton blend dress is from Polly Flinders, a timeless designer of classic smocked baby clothing. 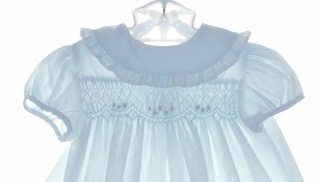 It features a yoke hand smocked in blue and embroidered with tiny pink flowers. The blue portrait collar is edged with a blue ruffle with white embroidered trim with a blue ribbon bow on the shoulder. The short puffed sleeves end with narrow sleeve bands. The dress features a 3" bottom ruffle and it closes in the back with two small buttons. What a precious little dress for your baby girl! This lovely little pastel pink cotton blend dress is from Polly Flinders, a timeless designer of classic smocked baby clothing. It features a yoke hand smocked in pink and embroidered with tiny lavender flowers. The pink portrait collar is edged with a pink ruffle with white embroidered trim with a pink ribbon bow on the shoulder. The short puffed sleeves end with narrow sleeve bands. The dress features a 3" bottom ruffle and it closes in the back with two small buttons.